You’ve welcomed your new kitten (yay! ), started feeding her (frequently), changing the litter box (a lot) and are wondering what’s next (sleep)? Well first, check out my blog on essential feeding instructions. Next, in addition to a parade of veterinary visits, vaccinations, toys and training; there’s an entire world of feline nuance and subtlety to discover. 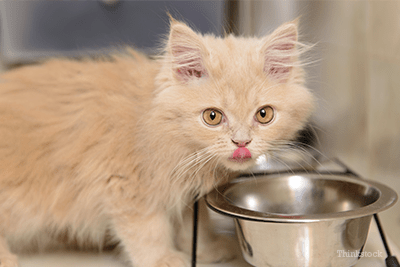 To help you on your journey, here are seven of my favorite feline “outside-of-the-bowl” healthy feeding habit tips and tricks you may not hear often—or often enough. One of my veterinary passions is reducing pet (and childhood) obesity. One of my top tricks to prevent overfeeding is using small food bowls, especially for kittens and cats. The theory is simple: Humans like to fill food bowls, both their own and their pets’. If you use smaller plates and bowls, you have less to fill. Soy sauce bowls, espresso cups/plates or any petite platter that holds less than ¼ cup are my favorite. Your kitten’s tastes and preferences are largely established during her first few months. Too many cats aren’t exposed to enough flavors, especially during the formative stage. Let your kitty sample fresh, oily fishes (especially wild-caught salmon and tuna, anchovies or sardines), poultry, turkey, and beef. If your kitten seems interested in something you’re eating, place a morsel in her bowl to explore [Editor’s Note: Check with your veterinarian first to make sure the item is safe]. If you’ve decided on a particular kitten food, ask your veterinarian if it’s okay to try other varieties with a similar nutritional profile. Variety is the spice of life; it’s also healthy for your kitten. Food is love for many of us. The trouble is when we “love” too much, we pile on the pounds. As little as an extra pound of fat on a cat is enough to put them at increased risk for diseases such as diabetes, hypertension and certain cancers. Some pet-food companies take advantage of our desire to please pets and provide loads of delicious, high-calorie and unnecessary treats. Be smarter. When you want to treat your cat, try a few flakes of salmon or tuna in convenient pouches. Reseal, refrigerate and use again within three to four days. Highly nutritious, wholesome, and low-calorie. Whatever treat you choose, use them consciously and sparingly. Cats are predators. They stalk, pounce, ambush and hunt their food. Tap into that inner predatory drive by moving the dinner bowls, even if only a few feet. This works especially well when you’re feeding your cats separately. I really like alternating feedings on an elevated surface such as countertop or table to floor each day. One meal high, the next low. Jumping and climbing also engages the largest muscles in the body, maximizing exercise and fitness. If you have one or two cats, try playing “Find the Food.” Simply put a few kibbles in several small bowls or plates and place them throughout your house while you’re away. It gives your cats something to do, helps enrich their day, and encourages them to move off the windowsill or couch. I typically reserve no more than about a third of the day’s food for this game in case one cat is a superior searcher. It’s important to understand how spaying or neutering affects your kitten’s metabolism. In general, removing a cat’s reproductive tract reduces its daily caloric needs 20 to 30%. It’s critical you talk with your veterinarian after spay/neuter to recalculate your kitty’s calories. Keep in mind pet-food feeding guides are formulated for intact animals and will be too high for spayed and neutered pets. How quickly your kitten grows is important. Gaining weight too quickly, or for too long, can create lifelong problems. Not gaining adequate weight or a failure to feed appropriate nutrients also spells trouble. A healthy habit is to regularly weigh your cat. Your veterinarian will weigh your kitten during each visit. Ask how your kitten’s growth curve is progressing. Too steep a curve can lead to obesity while flat can mean unhealthy development. After about nine to twelve months of age, weigh your cat at home at least every six months and record it. Simply weigh yourself, then yourself holding your cat, and take the difference. It won’t be as accurate as feline-specific scales, but you’ll be able to spot a trend in weight gain or, less likely, loss. If your cat adds an extra pound, call your veterinarian for feeding advice. It’s much easier to shed an extra pound or two than ten. There are hundreds of easy tips and tricks you can learn to better care for your new kitten. The most important decision you make for your cat each day is what you feed her. Think outside of the food bowl, educate yourself, and develop a close relationship with your veterinarian. Each kitten is unique and has specific lifestyle and nutritional needs. Working closely with your veterinary healthcare team, you can create lifelong, healthy habits that work for your life.